What an incredibly unique opportunity – a limited edition print of Jimmy Page’s guitars signed by both Jimmy Page and me…! Strictly limited to an edition of 50 prints, each 16×20″ Fine Art Photographic Print is individually numbered and has been hand-signed by both me and Page. Once the edition is sold out, it will never be made available again. Prints are available for purchase only on JimmyPage.com. Special Note to U.S. Buyers: The price shown on the site is in British pounds and includes a VAT tax for buyers in the U.K. only. 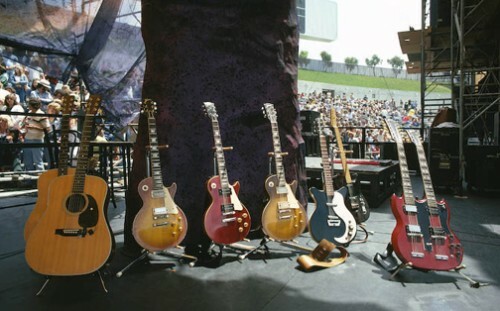 The equivalent price in U.S. dollars is approximately $1600 (no VAT), a phenomenal one-time opportunity for collectors of fine photography and Jimmy Page fans. Add the print to your collection before the price goes up and while it’s still available. Remember, there will only ever be 50 of these very special limited edition prints and several have already been sold. Please visit JimmyPage.com and place your order today!